Determine what size you want your poster to be and set an appropriate dimension in PowerPoint (Design Tab/Select Slide Size). 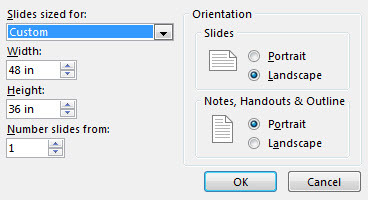 The maximum custom slide size that PowerPoint allows is 56 x 56 inches. Margins: Plotters will not print to the edges of the paper because of a quarter to a half-inch default printer edge; therefore, set one of the measurements at a half-inch (35.5 or 41.5) or an inch (35 or 41) less than the total width of the paper. An inch of white space around all the edges is visually appealing. Handouts: If planning to have handouts on 11 by 8.5 inch size paper, you may want to adopt that scale and size the poster to 60.5” x 46.75” (or smaller, depending on printer specifications). Here is a template for a 48" x 36" poster. This poster can scale up to 78" x 42" when printed. A great blog entry from Colin Purrington on how to create appealing and clear posters. Also check out his other entries on related scientific topics including plagiarism. NOTE: The maximum custom slide size that PowerPoint allows is 56 x 56 inches; however, the ITS plotters are 36 and 42 inches wide, so either the width or height setting must accommodate those limitations. If you need a larger size (e.g., 36 X 60), set up your poster for half the size, so it can be enlarged proportionately later. (Remember, some graphics will lose quality when enlarged.) Margins: The plotters will not print to the edges of the paper because of a quarter to a half-inch default printer edge; therefore, set one of the measurements at a half-inch (35.5 or 41.5) or an inch (35 or 41) less than the total width of the paper. An inch of white space around all the edges is visually appealing. Ben Azevedo, Class of 2013 presented this poster at the 2011 Teaching Scholar Award Ceremony and Research in Medical Education Day on Wednesday, March 23, 2011. By Matthew Calzetta for the Global Health Education Consortium meeting in October, 2011. Use this template but you need to find a QR code generator.